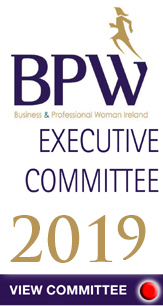 I am delighted to have been appointed President of BPW Galway for 2019, I look forward to working passionately on behalf of and with our members to share, educate and give a voice to Women, delivering to the best of my ability in the role of President of this wonderful club and community. I take inspiration from the many great Presidents of this club who have gone before me, paving the way for the development and growth of the club in support of our members and those who need a voice. I am delighted to be joined on the Executive by; Annette Walsh, Vice President, Attracta Real Treasurer, Sheelagh Mulcair, Secretary along with club rep Johanna Downes, Catherine Piggot, Moyra Mcmahon and Valerie Murphy ex-officio. BPW Galway provides a safe environment where women can come together to share our knowledge, support and advocate for each other and discover our true leadership potential. We champion women’s issues and causes making a positive difference in our own communities and beyond, breaking barriers and pushing boundaries to help in the progress, development and success of women across the professions. 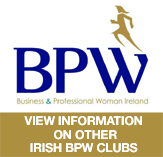 What makes BPW Galway so special are its people and the community spirit that the club embodies. Friendship and support are the cornerstone of what our club is built on. If you are looking to join a club or network of like-minded fellow females for networking, professional development, advocacy and friendship you don’t need to look elsewhere. 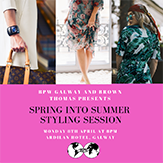 You will find your female tribe right here at BPW Galway. Highlights of the events this year include the Candle Lighting Supper in the Harbour Hotel on Friday Febraury 22nd. 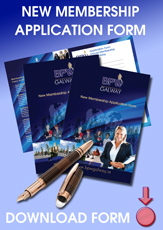 We continue our preparations with the EC 19 team to help deliver the BPW European Conference in NUIG from 24th – 26th May for BPW Ireland. 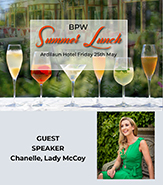 The Summer Lunch will take place on June 28th in the Ardilaun Hotel. We will also hold our annual Health Event, Schools Public Speaking Competition, Equal Pay Day Coffee Morning and Business Networking Event which each of which will take centre stage at various points during the year. I am really looking forward to my time as president for 2019 and I hope that I can continue to represent the club as competently and skilfully as it has been represented by those who have gone before me.